Yellow leaves swirl around me in the crisp autumn air, falling gently like soft snowflakes as the sound of chanting draws me past windows displaying golden Buddhas in the heart of Jongno, Seoul. I follow the rich voice as the sound grows louder and, turning up a small incline, enter the courtyard of Jogyesa Temple, the seat of the Jogye Order of Buddhism in South Korea. Having come to learn a little about Korean Buddhism, I cross the wide courtyard to the Information Center for Foreigners, hoping they will be able to give me some insight. The sound of the chanting is loudest here, and I notice it is emanating from the dim interior of a large building under construction to my right. Covered with scaffolding and tarpaulin, it is the focus for hundreds of worshippers who are kneeling and praying on mats underneath an ancient tree in front of its entrance. The air is filled with the sweet scent of incense, the joss sticks lit by worshippers and placed in a sandy trough by a tall, seven-tiered stone pagoda to my left, where a relic from Buddha's body is believed to be encased. As I walk up to the Information Center, I notice behind it is a magnificent pavilion with beautifully painted designs of blues, greens and reds on its supports and roof, and inside an enormous bell, standing silent in the center. I gaze at the enchanting architecture for several moments until a woman in her 30s, wearing loose-fitting jeans and a pony-tail, approaches me with an easy smile and invites me into the Information Center for Foreigners. She introduces herself as Ms. Jeon Man Kyung, the Assistant Director of the Information Center, and sits me down in the narrow office with hot tea and countless brochures about the temple. Soon after, a young woman by the name of Ms. Sujung Kim enters the center, breathless from running, and in near-perfect English, offers to take me on a tour of Jogyesa. Jogyesa was originally built in 1910 by the revered monk, Manhae Hanyongwun, at what is now Susong Park at the Gakhwangsa Temple. In 1938, the Daewungjeon Hall (the building that is currently being restored) was reconstructed at the present site, and served as the spiritual backbone for the Korean people under Japanese occupation. 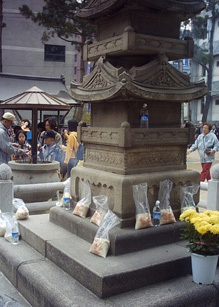 After Korea's national independence in 1945, the Buddhist Purification Movement was led by the Temple to erase the traces of Japanese imperialism. In 1954, it was renamed Jogyesa (‘sa’ means temple in Korean), and became the only traditional Buddhist temple located inside the boundary of the four gates built during the Chosun Dynasty in Seoul. 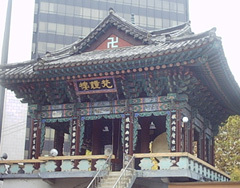 Korean Buddhism is the largest religion in the nation, as nearly half of the country's population is Buddhist. Buddhism in Korea is made up of 28 sects, or orders, which are joined together in the Assembly of the Council of Buddhist Orders. Among these 28 orders, the Jogye Order, of which Jogyesa is the head temple, is the largest, and has been practicing its traditions for nearly 1600 years. 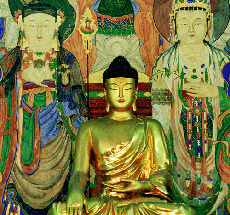 Buddhism first came to the Korean Peninsula from China in 372 A.D., and spread from the northern Kingdom of Koguryo to the southwestern Kingdom of Paekje. Buddhism was received by the royal families of those kingdoms, and contributed greatly to the establishment and strengthening of royal power as the ideological foundation of the nation. 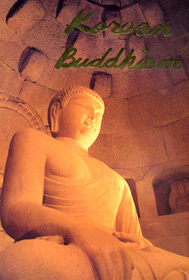 Meanwhile, in the Shilla Kingdom, Buddhism became the religion of choice for the common people. For the next 1,000 years, through the Unified Shilla period (668-935) and into the Goryeo period (918-1392), Buddhism was the national religion, and Buddhist art and culture flourished. At the beginning of the Joseon Dynasty (1392-1910), however, Buddhism slowly declined as the new rulers adopted Confucianism. This new interest led to the oppression and restriction of Buddhism by some Joseon kings. Temples could not be built near towns; instead, they had to be built in the mountains, the only place where Buddhists were permitted to pray. Thousands of these temples, most of the Jogye Order, still dot the mountains of Korea. In 1910, the Joseon Dynasty came to an end with the annexation of Korea to Japan. Although, Buddhism was greatly favored by the Japanese, celibate sects were discouraged and monks were encouraged to take wives, a practice that is not allowed by the Jogye Order. The sun feebly breaks through the clouds but does little to warm the morning air as Ms. Kim takes me around the Jogyesa complex. 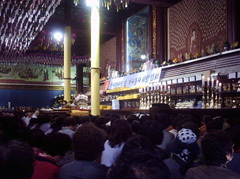 We pause for several minutes at the Daewongjun Hall, also known as the Main Buddha Hall, to observe a special ceremony. Ms. Kim explains that the ceremony is called kasa pursa, an important occasion that occurs only once every three years. During this special ceremony, lay Buddhists offer robes, which they have made over the previous two months, to the monks. Standing at the entrance, I gaze at the golden Buddha statues that line the back wall, the colorful paintings that cover the sides of the hall, and the green and white slips of paper along with lotus flower lanterns hanging from the ceiling, while worshippers kneel on the floor listening to the monk’s chanting. She tells me this hall is one of the major cultural treasures of Jogyesa, and symbolically represents the harmony of tradition and modernity. Leaving the Daewongjun Hall, Ms. Kim leads me to the Bell Pavilion, the beautifully- painted building that houses the enormous bell, which I had stopped to admire when I first entered the complex. As we walk up the stairs, my eyes take in the traditional Korean roof that spreads out elegantly, curving up in the corners, as well as the bright colors that are perfectly painted, co-existing harmoniously. Entering the structure, Ms. Kim points out not only the giant bell, but also a drum, a gong, and a wooden fish, all which are sounded at 4 a.m. and 6 p.m. as an orchestra to notify the monks of the respective morning and evening services. Next, Ms. Kim takes me up the stairs of an old, weathered wooden building on the other side of the Information Center, its windows covered with delicate-looking lattice. This two-story building holds the Culture and Education Hall on the first floor, which is used for lectures, exhibitions, and performances, while the Dharma Talk Hall on the second floor is reserved for lectures and practices. Ms. Kim explains that the Temple Life Program is held in this building. 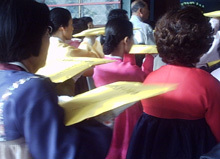 The Temple Life Program is a program for all those who are interested in learning about various aspects of Korean Buddhism and culture, including seon, or meditation, balwu gongyang, or four-bowl meals (a tradition among Korean monks), tea ceremonies, scripture printing, drawing of Buddhist paintings and lotus lantern making. She says that teaching non-Buddhists about Korean Buddhism is an important part of the culture. The education system at Jogyesa is comprised of three parts: the Buddhist Basic Course; Buddhist College; and Buddhist Graduate School. He says men enter the temple to become monks when they are between the ages of 18 and 40, and immediately enter a three-month period to think over their decision, whether becoming a monk is right for them. If they decide to continue, they enter the Basic Course, a one-year novice-level course where they learn basic temple life. At Buddhist College, a four-year program, they learn Indian, Chinese and Korean Buddhist history. Then for two years in Graduate School, the monks are taught how to become instructors themselves. As my tour comes to a close, we walk outside into the chilled autumn air, and I say good-bye to Dorim Saneem and Ms. Kim, who not only have enlightened me about Korean Buddhism, but also have made me realize the importance of education in Buddhist life. As I walk past the windows filled with golden Buddhas, the blanket of yellow leaves rustling under my feet, I am determined to return to Jogyesa, to learn more.